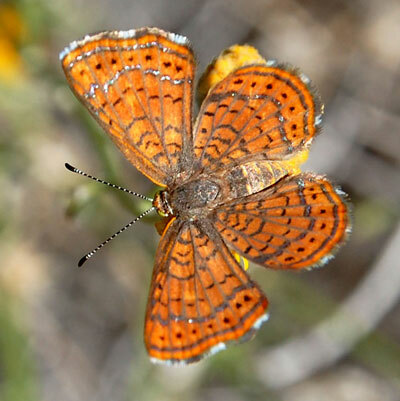 This male butterfly was photographed along the Agua Fria s. of Lake Pleasant, Arizona and is also hosted at Wikimedia. 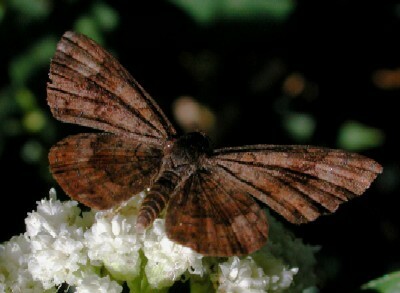 By mid summer these small brown butterflies are common in riparian habitats of the Sonoran Desert where they actively seek nectar at flowers, especially the white blooms of Seep Baccharis (Baccharis glutinosa). This plant is also the host for the caterpillar stage. The wingspan is less than 2 cm. Many species of metalmarks are strikingly colored with various metalic hues; this species glistens metalic depending on the angle of view.